I started with a 1/4 acre block of mostly lawn, and put in about 30 fruits in during the spring of 2011. It has been excellent fun. Depleted sandy loam soil. Site is at the top of streets running down to the east and south. Public park to the west, easement footpath runs along south east fence. Looking forward to seeing my circles based design fill in, and adding chickens to the ecosystem. Only another 5-8 more trees to put in, as stock becomes available. Except once I discovered the chill calculator I found out I am verging on medium chill, so I now have to find room for 5 or 6 stone fruit. 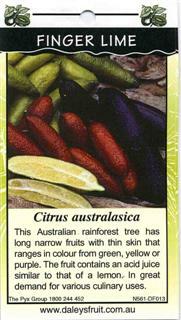 Comments: - All 3 (subtropical) varieties flowered well, but fruit set was limited to 2 per tree in their first year. The flowers are rose-scented, and the fruit is incredible- sweet, tangy, sparkling flavour, with crisp juicy flesh. Straight off the tree is definitely best. 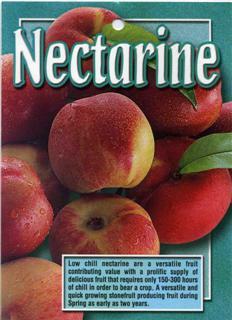 Bagging of fruit at 2cm in size. Comments: - Love the fruit, like eating rubies. Question: Is almost 2m tall, in it's second season, but the flowers keep falling off. Comments: - I've got a north-facing hot spot that needs a tough and productive plant. Only 50cm tall in a self-watering pot, and has 5 figs developing in it's first season. Comments: - Fantastic flavour, rarely seen the fruit for sale. Still in the pot as I'm waiting for kinder weather to plant it. It has already grown 5cm in semi shade. 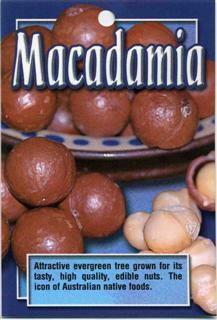 Is going in the shade of my large jacaranda tree. 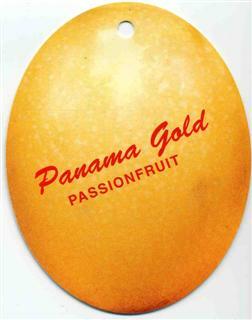 The most vigorous of my stonefruit, it has produced gorgeous golf-ball sized fruit that are golden inside and out. 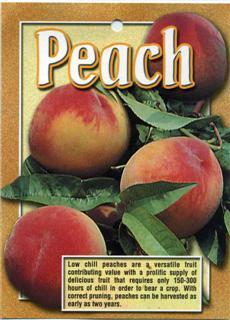 They are firm, and have the classic tinned-peach flavour - minus the tinniness! I will be cooking with these. The second of my stonefruit to ripen, just ready as the White Satin Nectarine finished. 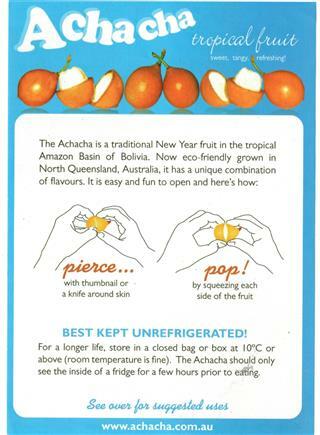 Ripeness was determined by when the fruit fell off the tree (into their paper fruit-protection bags). Comments: - Superb! Beautiful in every way, it has a lovely red skin, melting flesh, very sweet, very flavoursome. The earliest of my stonefruit to ripen, and also the smallest tree. Would recommend this to anyone with a similar climate to Brisbane. I gave more water than usual during fruit formation - about 10L bucket of water alternate days. Pest Control: Had a few fruit on it when I purchased it, and will be bagging them shortly. Comments: - Fruiting already...waiting for them to ripen... Waited impatiently all winter for them to colour up. 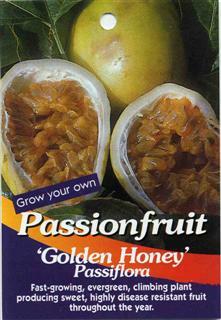 Have had variable quality fruits off the same plants, from best passionfruit ever to a bit bland snd sour. Had quite a few fruit drop off apparently un-pollinated, withered and empty. I figure I'll just put in more vines. 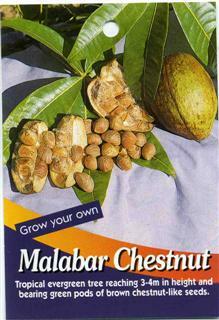 Second season had much better results, and friends and family prefer this variety over the panama red. Pest Control: Fruit have been stung by something but the skin just thickened up in those spots, pulp was unaffected. Comments: - Quick, productive, healthy enzymatic fruit. The scent of the flower converted me to the fruit. The red is my favourite, and I've planted a lime just to go with the papaya. The lime enhances the sweetness and neutralises the smell that used to repulse me. Seeds a good substitute for pepper. Unfortunately all my papaya have contracted black spot. I'm getting a few fruit, but they all have unattractive damage, though the flavour is still very good. 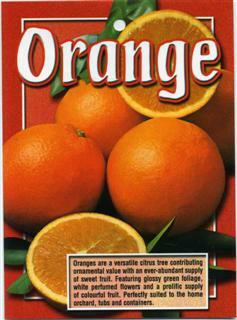 Fertiliser or Organics Used: Occasional organic liquid fertiliser. Pest Control: Affected by black spot mould, I've removed the leaves affected till I get around to spraying. They haven't been able to bring fruit to term, perhaps because they are diseased. Question: Is there any comeback from black spot fungus? 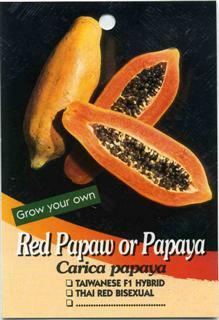 All 3 of my papaya have it and they cannot produce fruit. :( I've been removing diseased leaves as the spots become evident. 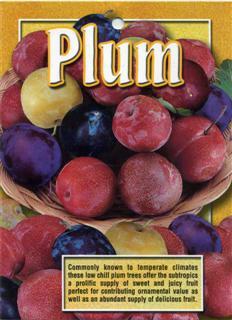 Rich, sweet, a little musky, slightly tangy, reminiscent of a good plum. Precocious, hardy, productive. In the second season it has about 3 fruit coming out of each bud all over the tree, in 2 main flushes, and a few fruits after this as well. It seems each new set of leaves has flowers emerging with them. Very happy with these trees. 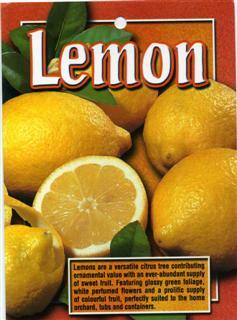 Fertiliser or Organics Used: Occasional liquid organic fertiliser. Pest Control: None necessary so far, will be watching out for birds. Comments: - Pretty tree. Looking forward to finding out how it tastes. Has set lots of fruit in it's second spring (1.3m tall), and am keeping up the water to it. Question: Anyone tried the fruit? Anyone growing it in south east Queensland? 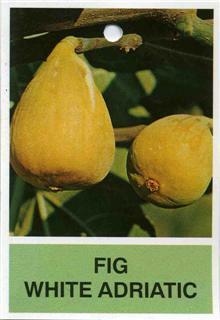 Looking for a fruit that I like that can replace my sheena's gold hedge. Just trialling it this year, keeping in self watering pots. Have had a few fruit ripen that were on the plant when delivered. 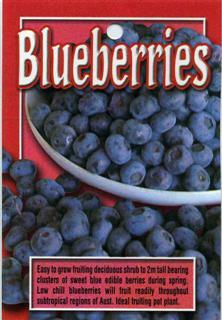 The fruit is much better than supermarket berries, sweet and tangy. Question: Not looking too happy. Can't remember if I put charcoal in the base of the self-watering pot. Hoping coffee grounds will add enough acidity. I appreciate the grapefruit flavour without the bitterness and sourness. And I find the grape-like clusters of fruit very appealing. It has grown very well in a sunny spot after one year, at almost the same rate as my Eureka lemon. 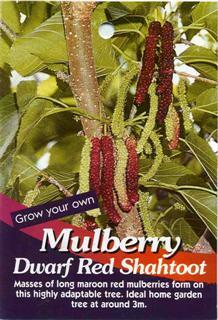 In my previous garden I put the same variety in a shaded spot and it was very slow growing- until it reached the sun. 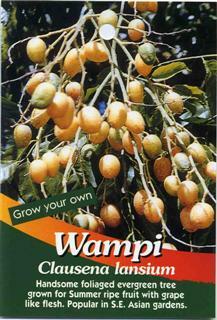 Question: I tried an elongated Wampi at Tropical Fruit World, and am wondering now if I should have planted a Yeem Pay variety. Anyone compared that with the Guy Sam? Comments: - It's likely my greengage won't have enough chill to fruit, so this is my backup plan. 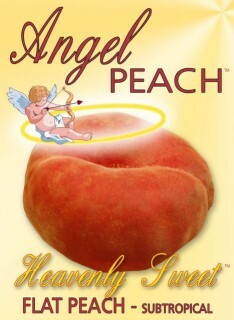 Comments: - Wanting to try tree-ripened peaches as supermarket stone fruit are generally very disappointing. Pest Control: Will be bagging it like all of my other fruit that are susceptible to fruit fly and possums. 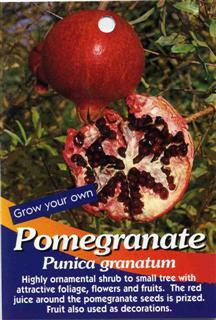 Comments: - Easy to propagate, I just take the top off store bought fruit and put them in the ground. I don't give much care to them. They are part of my perimeter defence, spiky things around my fence line to discourage trespassers. Interesting flavour, nicer than raw peanuts. Tree is quite striking when mature. 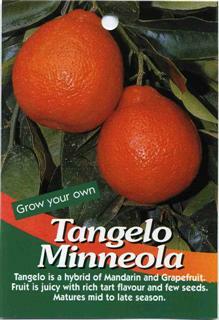 Comments: - I prefer the tangy types to cavendish, and this is the variety permitted in QLD backyards without a permit. Pest Control: No problems yet, but I keep it tidy, trimming off the old leaves and keeping the bases clear. Comments: - Delicious, and too expensive in the shops to really indulge myself as much as I'd like. Likes water, and is doing much better with a seeping hose than hand watering. Comments: - Part of a protective hedge around the perimeter of my yard. Wanted a range of colours in the finger limes. Comments: - Superb flavour, refreshing, far better than dragonfruit. Has grown 1m this rainy spring and summer. 3 plants against fence, 4 more to go in during spring 2012. Question: Advice on options for supporting the vine? Comments: - Easily recognizable fruit, partly motivated to put this in for whoever buys my house when I eventually sell. And it should look beautiful in fruit. Think I'll let the fruit stay on now it has been in the ground for a year. Prolific and beautifully scented flowers. Pest Control: The old bush lemon behind it had suffered from gall wasp, leaf curl, leaf miners etc etc. and have had to take it out to prevent my healthy citrus getting infected. The orange and all my other citrus are healthy so far. 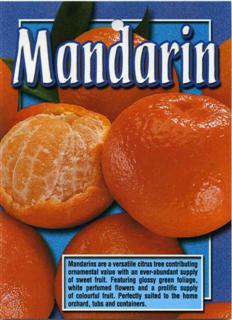 Comments: - Looking to replicate the superior flavour of homegrown mandarines from an ex-neighbour's tree, but wasn't sure of her variety. Dwarf type. Comments: - To use with my papaya. Dwarf type. 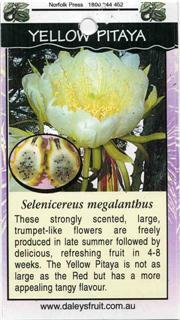 Fruited in first year, and flowering prolifically in second season. Part of a citrus circle, so that when full grown it will smell intoxicating in spring. 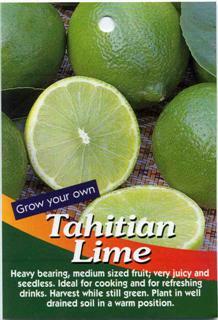 Comments: - Said to be the tastiest of the finger limes, but the plant isn't doing as well as my other finger limes. Comments: - Protective hedge on my boundary, groovy little sour balls like caviar. Comments: - Planted with the Reed, first season in the ground it produced masses of flowers, but took these off to let it concentrate energy into leaves and roots. Comments: - My favourite nut of all time. After 1 year it has had very little growth and consistently yellow leaves. Thinking of moving it to a more protected position and giving it manganese in the new hole. Question: Mine is pale, yellow tinge to the leaf. This is the only plant I'm worried about in my garden. 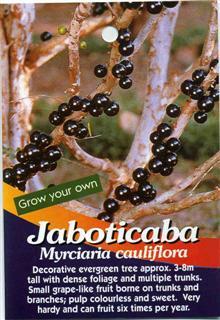 Comments: - Love the intense grape-like flavour, and a very pretty small tree, delicate foliage. Mine won't be fruiting for a while. The one on the south side of my house is doing slightly better than the one on south-west. In my previous yard, the tree is almost 2m tall and still hasn't fruited after 6 years...but it will be worth it one day. Comments: - Haven't tried this variety, but liked the reviews I've seen. 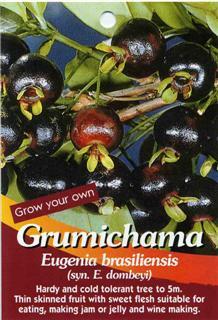 Comments: - Growing this as a sub-tropical substitute for cherries. Liked it when tried at Northey Street City Farm. Comments: - Has been the best tasting variety under local conditions for me so far. Beautifully sweet and moderately fragranced. 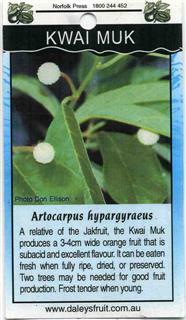 Comments: - Tastes like cherries, how fortunate to find a subtropical equivalent. 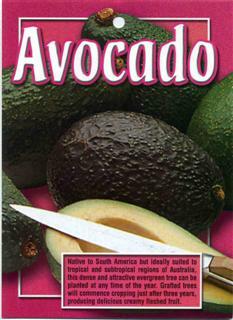 Question: Anyone growing this with success around south east Queensland?